The Coral Identification Capacity Building Program is pleased to announce the publication of the Indo Pacific Coral Finder by Russell Kelley. The Coral Finder is a proven, practical, underwater coral identification tool that allows anyone to identify hard corals to genus, regardless of growth form, anywhere in the Indian and Pacific Oceans. Coral identification is considered difficult because of the sheer number of species and variation in growth form with environment shown by corals. The Coral Finder solves this problem with a unique visual approach to coral identification that lets the user find the genus name of the coral they are looking at in less than a minute. 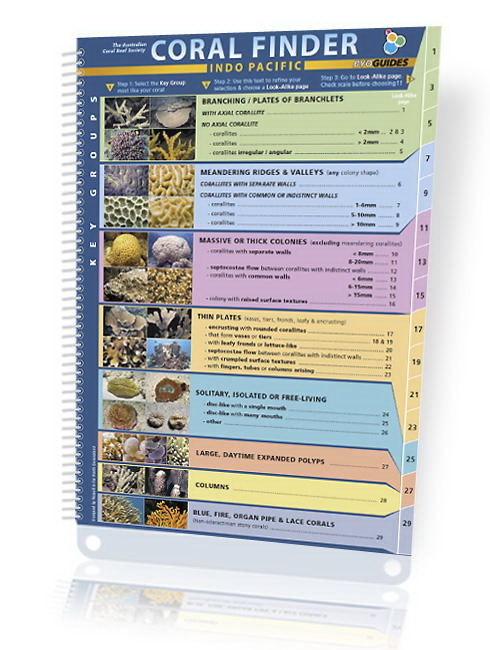 The Coral Finder not only makes coral identification practical it also provides the user with a volume and page number cross reference back into Charlie Veron's Corals of the World for after dive follow up and learning. The Coral Finder was designed to provide a friendly, practical way to teach yourself coral identification. It gives instant results to the motivated learner by using a visual navigation system based on shape and form. This user is directed to a simple visual choice matrix of relevant results. Free from the limitations of text based learning anyone with a good eye can make powerful visual decisions. The Coral Finder is ideal for monitoring, surveys, students, scientists, dive masters, underwater naturalists, aquarists and CITES / coral industry professionals. Development of the Indo Pacific Coral Finder was supported by the Australian Coral Reef Society and Professor Charlie Veron (Author of Corals Of The World). The Coral Finder will be supported by a website of free learning resources including video training movies from beginner to advanced - due for completion later in 2010.